Discussion in 'Custom Mods' started by JSHRAM, Jul 10, 2018. I love my Viking pipes but like all custom pipes they tend to turn your your right leg into a bratwurst that's been forgotten on the barbe... even more of a problem in Las Vegas temperatures above 40C... So, I made several patterns and had a guy make brackets, cut, bend and weld them on to a piece of stainless. My original instructions were for him to radius bend the shield, but he did sharp bends, which don't look as good and don't really match the lines of the bike.. we had a disagreement. Anyway, I got the shield, powdercoated it black and put it on. Wow! This makes such a HUGE difference. I can sit at a light, ride slowly or cruise the twisties in the heat.. my leg intact and shoe un-melted. If you look closely, we bent the shield below the pipe and above it, plus the guy welded pieces on the front and the back (hard to see) to keep heat in. As much as I'd love to keep those beautiful pipes exposed and visible, this is ride-able and I really like my leg more than being pretty... It is an amazing difference. BigNorm, rng3, Joesmoe and 1 other person like this. Nah, I couldn't do it if I had Viking headers. 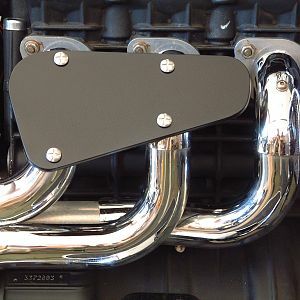 If you need them, much smaller and following pipe should suffice and maintain the look. But as you say if 40C regularly in traffic I would have a heat shield of some sort. Not my cup of tea you are hiding Paul's beautiful work, I ride in just as hot if not hotter temps with Carpenter Sidewinder pipes and do not find it bad enough to hide the pipes. JSHRAM and Dr.D like this. Love the color of your bike! Just curious if you had the bike tuned when you put the pipe on? Reason I ask is I have a similar header and its no hotter than it was stock except maybe at a traffic light after it was tuned. But, in any case if your happy thats all that matters! But @Paul Bryant headers are sooo nicely made and look great, its a bummer to have a shield on them! Strange that so many people have a problem with Paul's system and the heat. Had Hanso's tune on the bike and it worked out fine. Pipes did get a little hot during the summer in stop and go traffic. Running Claviger's tune pipes are running a lot cooler this summer. Was not much of a issue before but now i do not even think about it. A good tune can make a major difference. Yes it gets very hot during the summer in Oklahoma. 90 degrees plus and very high humidity can be almost unbearable at times. Another factor are exhaust leaks. Even a small leak can make a major difference. Granted they are naked pipes but believe if tuned correctly and no exhaust leaks the pipes work out fine. Not saying your bike is not tuned correctly but it is worth checking out. May work may not. Every time I wash the bike we do a soap test on the pipes. Spray bottle and paint brush. Have not found any leaks since adding double washers to stock acorn nuts. Prior to doubling up washers had a problem with leaks ever so often. Just thought i would share a bit of tribal knowledge. JohnsoD, JSHRAM, Paul Bryant and 1 other person like this. I can understand the shield - I made one up too (though I don't have Paul's pipes) - I was pissed of with pants melting onto them. Though proper 100% aramid lined jeans work well too. But not sure that bending the edges over is that clever. I would want some airflow over the steel pipes. JohnsoD and JSHRAM like this. So @mully95 and I both have Viking headers, and he turned me on to a small heat shield and I really like it. Here is my Viking exhaust.... seen it before I know. Thinking about sending the exhaust off to have it black ceramic coated but not sure about them blacking out the aluminum SuperTrapp muffler. Might have some issues with the coating. Debated the CES and Sidewinder exhaust before settling on Viking. Didn't want the additional heat the other exhausts produce. Didn't have different cams, or head work so the big tubed exhausts would be a waste of time. As well as I don't ride around at wide open throttle all the time either. I found some generic ones that fit well.